Every year, roughly five to 20% of people living in the United States will get influenza, or the flu. The flu is a seasonal, common virus that sometimes seems almost as common as a cold. There are three distinct flavors of influenza, helpfully labeled types A, B, and C, and from there they are further divided into subcategories and types. For anyone not involved in medicine, the main distinction between strains is who can catch them from what. Type A influenza, for instance, can jump from animals to humans and result in things like swine flu or bird flu scares. Influenza type B is only transmittable from human-to-human, and type C is both milder than the other two types and doesn’t transmit well enough to cause outbreaks. Let’s take a closer look at type B influenza, though it should be noted that most of the information here can be generalized to a certain degree across other forms of the virus. So what is influenza B? Influenza is caused by a virus, and like all viruses, it operates by hijacking cells for its own reproductive purposes. The flu is particularly good at this task. There are two main reasons why the flu is so common. The first is that it knows how to get around. Influenza can travel through the air in droplets of moisture, allowing it to be spread whenever people talk, cough, sneeze, or exhale in general. It can infect you by being inhaled or if you touch a tainted object (keyboards, doorknobs, and other common surfaces are big culprits) and then touch your eyes, mouth, or nose. The second reason is that the flu mutates constantly. Being a virus is a lot like being in show business—you have to keep changing your act and reinventing yourself or else you get eaten by white blood cells. Influenza A mutates fairly regularly, with new strains appearing seasonally and requiring new vaccinations since the changes allow it to avoid older antibodies. The influenza B virus mutates into a new strain every few years, while C doesn’t do it enough for doctors to be worried. Stomach irritation, including loss of appetite, vomiting, and nausea. Influenza A also causes most of the same symptoms listed above. 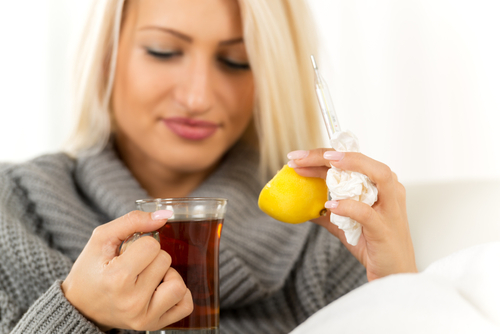 Influenza C generally only causes a mild fever or cold-like symptoms, if any. Pneumonia: Viruses and bacteria do not normally work together, but sometimes influenza B can damage the lungs enough to make them more vulnerable to getting colonized by bacteria. The resulting infection causes swelling, inflammation, and fluid buildup that can cause shortness of breath, chest pain, coughing, and fever. Pneumonia is the most common influenza B complication and is most likely to strike the elderly or those experiencing another chronic illness. Encephalitis: This is a form of brain inflammation that can rarely be cause by influenza exposure. It presents with headaches, fever, confusion, and drowsiness but can advance into seizures, fainting, or coma. Myositis: This is a form of muscle weakness and inflammation that can be brought on by certain viruses, among other causes, and mostly affects children. Main symptoms include difficulty moving the legs, weakness, and tenderness in the affected area. Other Infections: In the same way as influenza B can make you more vulnerable to pneumonia, it can also make you more susceptible to bronchitis, sinus infections, and ear infections. These are unpleasant, but fortunately far less serious ailments than pneumonia, though they share the same at-risk groups. When treating yourself or someone else for the flu (or any other viral infection), do not give then aspirin, especially if they are a child or teenager. This can result in a condition called Reye’s Syndrome, a serious swelling of the brain that can cause delirium, nausea, persistent vomiting, confusion, lethargy, seizures, irritability or aggressiveness, and, in infants, diarrhea. Fluids: Whether you use water, juice, flat ginger ale, or chicken broth, it’s important to keep up the fluid intake. Dehydration helps no one and the liquids are less likely to provoke an upset stomach. Rest: Snuggle up on your sofa or in your bed and get some proper rest. It will prevent the aches and fever from getting to you while letting your body focus on fighting off the infection. Pain Relievers: If the body aches are becoming too much, consider over-the-counter treatments like Advil or Motrin to help make things more bearable. As mentioned above, do not use aspirin for pain relief. Antivirals: These are not usually necessary since the flu will pass on its own within a few days. However, some cases may warrant the use of drugs like Tamiflu, though you should only do so on the advice of your doctor. These treatments will reduce the duration of the flu, but come with side effects; whether it’s worth it or not will be up to you and your doctor to decide. As with most flu viruses, the best way to avoid getting influenza B is to get vaccinated. Although influenza B doesn’t mutate as frequently as A, the annual vaccination protects against both. The flu vaccine is sometimes hit-or-miss when it comes to influenza A (since it involves a bit of predictive work), but it’s usually on-target when it comes to protecting against influenza B. Aside from vaccination, the only other preventative measure is basic sanitation measures. Wash your hands regularly, use alcohol-based sanitizers, etc. You can also avoid crowded areas like subways, buses, daycares, or office buildings during the height of flu season to minimize your chance of exposure. In the event that you do get influenza B, perform common courtesies like covering your mouth with a tissue or your arm when you cough or sneeze, and stay home and get better rather than go out and risk infecting others. Duda, K., “What Influenza B Means for You,” About Health web site; http://coldflu.about.com/od/flu/f/influenzaB.htm, last accessed February 23, 2016. “Different Types of Flu: Influenza A, B, C and More,” Web MD web site, August 17, 2015; http://www.webmd.com/cold-and-flu/flu-guide/advanced-reading-types-of-flu-viruses#2, last accessed February 23, 2016.